AppleOne and The Act-1 Group wish you a wonderful Thanksgiving! As we give thanks and spend time with loved ones on Thursday, our CEO, Janice Bryant Howroyd, invites everyone who will be watching the Macy’s Thanksgiving Day Parade to cheer on her alma mater, North Carolina A&T State University! 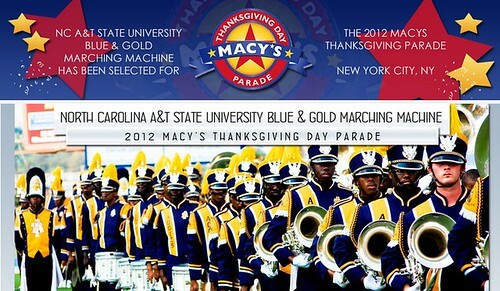 NC A&T’s band, The Blue & Gold Marching Machine, was selected to be the lead band out of 11 marching ensembles in the 2012 Parade. The competition to be in the parade was fierce this year as more than 150 bands applied for the eleven slots. The Blue & Gold Marching Machine’s outstanding entertainment, musical ability, marching and performance skills took them to the top of the list as one of only two collegiate marching bands and as the first from one of the Historically Black Colleges and Universities (HBCU). As the band upon which the the highly successful and profitable movie, ‘Drumline’, was based, The Blue & Gold Marching Machine has inspired millions–and Janice proudly counts herself as one of them. It is from her school’s culture that she took her often-repeated team building quote, “One Band, One Sound!” which teaches us to all have our voices heard, and to learn to march in unison as a team. In addition to being an alumnus, Janice also serves as a member of NC A&T’s Board of Trustees. She joyously and proudly invites everyone to join her in enjoying and supporting the amazing Blue & Gold Marching Machine as they give the performance of a lifetime as the parade’s Lead Band. This means that you will need to begin watching at the very beginning of the parade, or set your DVR or Tivo so you can enjoy this outstanding band later, and over and over. The Blue & Gold Marching Machine will be the front band in the parade, kicking it off to what should be an amazing success. The Macy’s Thanksgiving Day Parade will be broadcast on Thursday, November 22nd on NBC starting at 9am Eastern. Check your local TV listings for when it will be shown in your area.